Finance chiefs are often the bearers of bad news during earnings calls, with share prices reaping the consequences. That’s why many -- particularly in the tech industry -- shy away from giving precise outlook figures. Dave Wehner learned that lesson the hard way. Shares of Facebook Inc. fell as much as 20% this morning following the CFO’s sober forecast for revenue growth this year after the market closed Wednesday. The stock is down 19% in recent trading. Mr. Wehner also said new advertising formats were less profitable than expected. With investors used to getting record-breaking results quarter after quarter, finance chiefs at technology companies, especially at heavyweights like Facebook, Alphabet Inc. or Amazon.com Inc., must be adept at managing the company’s message and expectations when the news is grim. A sharp, reactionary swing in share price following a quarterly report dramatically raises the stakes for the next quarter. Comment: Below is my missed FANG investment. So yeah it was a missed opportunity! 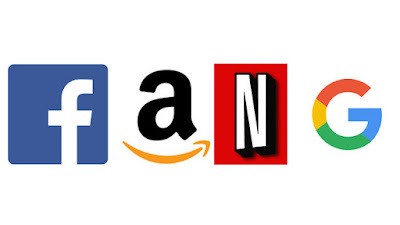 Of the FANG stocks ... 1.) I have none: 2.) AMZN, GOOG, and NFLX have value to me.